The Shocking Blue easily compresses into a medium size compression bag with room left over, which is pretty amazing for a 4-season bag. The Shocking Blue compressed better than all other bags in this category. 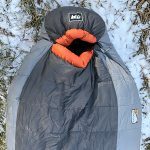 The Shocking Blue Neo had the best warmth to weight ratio in this category, but was not the warmest bag in this test. The Marie Antoinette collar made a big difference in the warmth of the bag when used correctly. The hood of the Shocking Blue was warm and comfortable and the anatomical construction of the foot box and the main compartment of the bag allowed for comfort without extra dead space, making the bag warmer overall. While a very lightweight and warm bag, the 12F comfort rating proved to be a bit generous. The Valandre Shocking Blue is roomy and warm for its weight. The baffles allow for the down inside the bag to “puff” up, creating a very comfortable fit and feel. 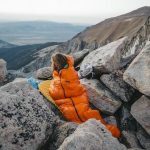 It has the most technical collar and hood on any bag I have tested and a foot box that allows me to point my large feet up into the air all make for a very comfortable sleeping bag. The Shocking Blue did not suffer any noticeable wear and tear and held up very well during the testing phase.The Shocking Blue Neo easily handled tent condensation and the rigors of cold weather camping. The Shocking Blue Neo has some of the most technical features of any bag in this category. The cut of the bag is entirely anatomical and is made from 80 custom-cut fabric panels assembled in a 3D-baffle construction. This allows the down inside the bag to loft easily. This also allows the top of the bag to hover over your chest instead of lay on your chest, to keep the down lofted. The hood is designed with a half-moon style and its static draw-cord allows you to tighten it down over your head and across your neck to keep drafts out. The Marie Antoinette draft collar is the best collar I have tested. It allows a full 360-degree easily adjustable collar and completely stops all drafts from entering the bag around your neck. You can unzip the Marie Antoinette collar and use the bag for sitting around in cold conditions.